David Gilmour was joined onstage in London by Benedict Cumberbatch for a performance of Pink Floyd classic Comfortably Numb. The Sherlock actor was introduced to Gilmour by a mutual friend and when the Pink Floyd icon asked him to perform the song, Cumberbatch jumped at the chance. The collaboration took place last night (September 28) during Gilmour’s show at the Royal Albert Hall and video footage can be viewed below. 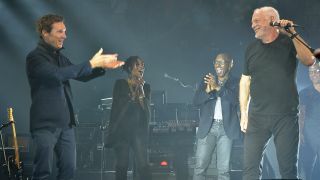 It’s not the first time Gilmour has been joined by a special guests to sing the track at the famous venue. In 2006, David Bowie also sang Comfortably Numb with Gilmour in what was to be the late star’s final UK stage appearance. Gilmour’s world tour in support of latest album Rattle That Lock wraps up with two further shows at the Royal Albert Hall tonight (September 29) and tomorrow. Pink Floyd are the cover stars of issue 70 of Prog magazine, which is out now in print and via TeamRock+. The issue also features Opeth, Brian Eno, Van Der Graaf Generator and Gong, among many others.